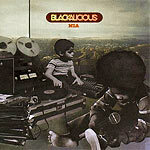 Not their first one, but this is the album that got Blackalicious much of the recognition they deserve. Many people will tell you that this is their best album out there. 1,2,4,5,7,8,9,10,11,12,13,14,15,16,17 and 18 produced by Chief Xcel. 3 produced by Lyrics Born. 6 produced by DJ Shadow. Cuts by Chief Xcel, DJ Ice Water and DJ Quest. Vocals by:Gift of Gab, Erinn Anova, Lyrics Born and Lateef.